Introduction: Nowadays, plastics play an important role in many industrial applications. During the production of plastics, plasticizers are added to enhance the properties of parent polymers, but some of them have shown xenoestrogen activity and their continuous exposure to humans can constitute a health risk. Sensitive and selective analytical methods are required to control the presence of these compounds and to assess the health risk. Objective: The aim of this paper is to review the analytical methodology used to determine plasticizers in food and beverages and to highlight the most important milestones and drawbacks observed in this field. Methods: The last decade literature has been reviewed. Emphasis has been placed on “blank” problems and in the application of separation techniques coupled to mass spectrometry, but the potential of ambient mass spectrometry techniques has also been addressed. Results: Separation techniques coupled to high-resolution or tandem mass spectrometry are the techniques most frequently used in this field. Nevertheless, the ubiquity of some plasticizers can contribute to background levels hindering quantitative results. The strategies applied to avoid/minimize this contamination are critically discussed in this paper. 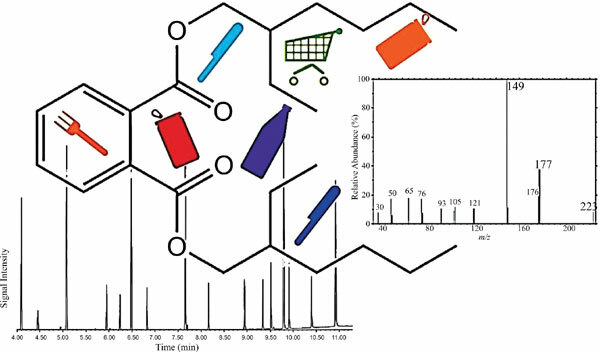 New methods based on ambient mass spectrometry have emerged to directly analyze samples avoiding sample manipulation and overcoming blank problems. Conclusion: The development of fast, simple and automatable methods to reduce analysis time and to avoid sample contamination is still needed. The future use of ambient mass spectrometry techniques for a fast screening with minimal manipulation of samples can be helpful. The evaluation of alternative ionization methods in mass spectrometry would expand the number of compounds to be identified and will help in solving possible matrix effects. Plasticizers, phthalates, food contact materials, food packaging, GC-MS, LC-MS, ambient mass spectrometry.